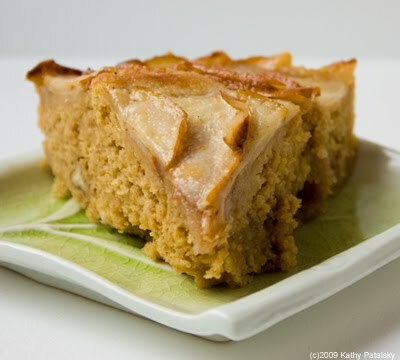 Pear Right-Side-Up Cake. Super Moist. Low-Fat. There's no need to feel upside-down after a dessert treat. This recipe will leave you feeling right-side-up. 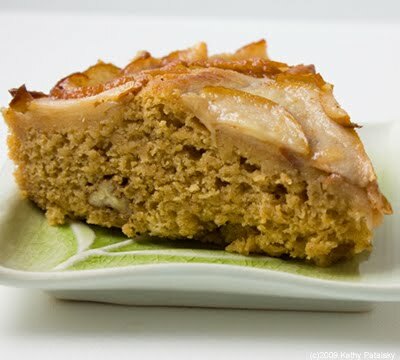 My Pear Right-Side-Up Cake is a super moist, perfectly sweet, low-fat dessert or tea cake that will not only taste delicious, but look quite charming. 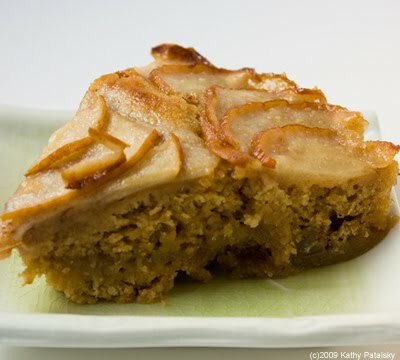 Lovely layers of elegant bosc pears line the top of this tart-like cake. Serve with a hot steamy cup of tea, coffee or a spicy hot soy chai. Perfect Pears. Perfectly mandolin-sliced pears are the secret to this pear tart. Thickly-sliced pears won't cut it. Moist Secret. 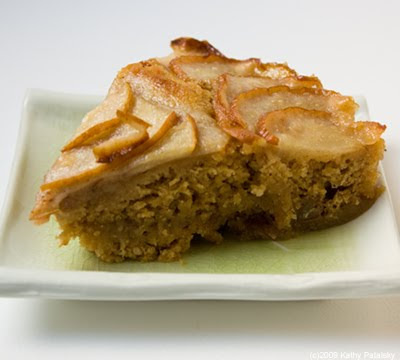 My secret for a low-fat, yet super moist cake is the butternut squash puree. For super moist baked goods, it just works perfectly every time. Plus it adds in a nice dose of healthy butternut squash fiber and vitamin A. 1. Wash your pears. Remove any soft or brown spots. Mandolin slice them into very thin slivers. You can have a few that are oddly shaped, but make sure to also get a few that have a pretty pear shape to them-these can be your top layer pears. 2. Add all your pears to a large bowl. Also add in your cider, citrus juice, zest, ginger, cinnamon and vegan buttery spread. Omit the spread for fat-free. Add more spread for a more decadent cake. You can also add in a Tbsp of brandy if you'd like. 3. Toss the pears gently in the liquid and set them aside to soak for at least 15 minutes. 4. Start your batter. Mix all the dry ingredients in a large bowl: flour, sugar, salt, cinnamon and baking powder. 7. Layer the pears. You will place about 3 layers of pears on top. You can start off with the oddly shaped pears, and work your way to a pretty design of the 'pear-shaped' pears. I like to layer from the outside-in. 8. Lastly, pour your 'topping' liquid mixture over top the pears, and add a very light sprinkle of sugar on top as well. 9. Place in a preheated 350 degree oven for 30 minutes. 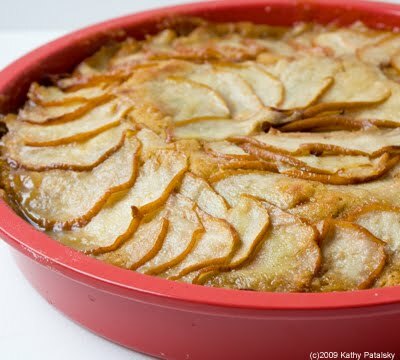 Or until the pears look fully baked and the outer edges of the cake start to pull away from the pan. For the late 5 minute of baking, turn the oven on high broil to allow the top pears to caramelize and brown up a bit. This will also prevent 'mushy pears'. 10. Allow to cool. You can serve warm, but I actually prefer this cake chilled in the fridge overnight. 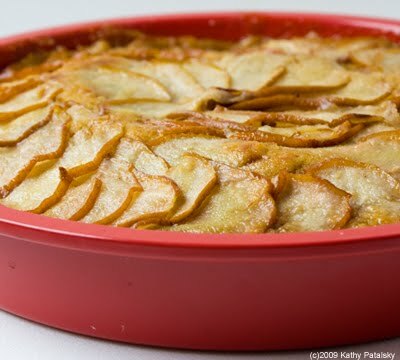 It allows the cake to firm up and the pears to really soak into the top layers of the cake - in a right-side-up way. Remove cake from fridge about 15 minutes before serving.